Like a senile old granny who could no longer be trusted to care for herself, dear old Palm OS was quietly shuffled off to the retirement village by former CEO Ed Colligan back in February. Since then, it's suffered the fate that befalls most seniors: completely ignored by relatives who just wish it would hurry up and die already, so they can get their hands on the inheritance. Fortunately for mad old FrankenGarnet and her condo full of stray cats, she still holds a special place in the hearts of a few... like the good people at MetaViewSoft, for instance. 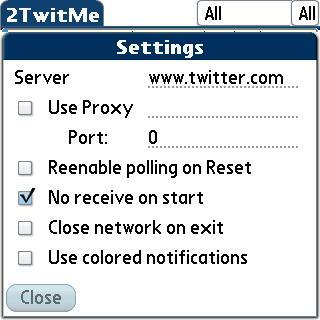 The first step you'll need to take on installing 2TwitMe (henceforth, 2TM) is setting up your Twitter account(s). Via the Others -> Accounts menu, you can set up (in the beta of version 1.2 that I reviewed) up to twelve Twitter accounts. For those frugal types concerned about the amount of data they're pulling down - or those who just don't want to be totally snowed under by a massive infodump - you can also choose how many tweets and direct messages that 2TM will download, from 20 to 200. For each account, you can specify exactly what you want 2TM to capture: tweets, direct messages, @mentions and Twitter Search results, for which you can set specific search terms that will then appear in the main stream. 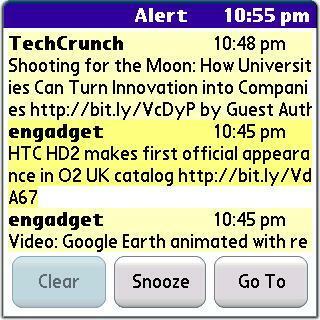 An option for colored notifications, which again is self-explanatory. 2TwitMe's main screen is much like Twitter itself: clean and simple. You have the obligatory Palm OS app menu up in the top-left corner (which hides refresh options, fast go-to shortcuts - very handy! - and the aforementioned Settings options), and a picker to switch between your various Twitter accounts in the top-right (as well as an option to view all of them). Whenever the app is communicating with the network, a small icon will appear in the top-right corner. Unfortunately the app will be frozen while it does this. While that won't be much of an issue on fast connections, it is slightly annoying on slower ones like mine, although the fact that tweets aren't very bandwidth-hungry does help. Taking centre-stage is the main event, the Tweetstream (my name). The first thing you'll notice is how it manages to squish nine tweets onto a 320x320 screen, by virtue of using Palm OS' small fonts (You should also note that even if you're using a font replacement program like Fontsmoother, it'll still use a small font no matter how big you try to make it). This is definitely going to be a divisive design choice for users. Personally, I prefer the use of small fonts, because my eyes work just fine and I prefer having more information onscreen at once to having to scroll endlessly. That said, it'd be nice to have the option to set the font size, as small fonts are not going to work for everybody. The Tweetstream displays the Tweeter's username, the timestamp and about the first 80 characters of each Tweet. You can scroll the list with the five-way navigator, by tapping the up/down arrows in the right corners or - my favorite - finger-swiping to the top or bottom of the screen. It's not a webOS-quality "elastic" swipe, but it's still cool. Beneath the Tweetstream are more self-explanatory options: Refresh, Post and an Auto button which will toggle 2TM's background polling. With this option enabled, 2TM will notify you of new tweets via the standard Palm OS notification alarms even from within other apps (see the screenshot, right). Tapping any individual tweet will pop-up a smaller window atop the Tweetstream. From here, you can reply, re-tweet, direct message the Tweeter or add it to your favs. If you hit up/down on the five-way, you'll automatically skip back and forth through the Tweetstream, which is most convenient. You can also tap links within the tweets, and it's here that we discover 2TwitMe's coolest feature (especially for, as I mentioned earlier, those like myself who are stuck with 2G GSM Palm OS phones). There are limitations: you can't click links within the pages you're previewing, and you can't copy text from the preview page. There are also some character display issues: for instance, Mexico's becomes Mexico & # 8 2 1 7 ;s. Hopefully MetaViewSoft will fix this in a future update. But even with these caveats, it's still a great feature. Also when viewing individual tweets, if you click on a username or an @mention, you'll display another pop-up window that shows basic profile information on the user: their real name, location, profile picture and Follower/Friend/Tweet counts. It should be noted that profile pics don't always display - another item for the bug tracker. There's also an option to Follow that user, but it doesn't work as of this version. Tweeting from 2TwitMe is an exercise in simplicity. Hit the Post button, and a pop-up window appears from which you can broadcast your inane innermost thoughts to the world. You can pick which account you wish to tweet with, and if you hit the Image button, you can upload a picture to Twitpic - either by choosing an image from your library or capturing one directly from the camera right then and there. Here's one I prepared earlier, taken from my Centro. Unfortunately, there's no automatic URL shortening, which does make it a little more difficult to share links than it is from more advanced clients. And that's all she wrote! Twitter's appeal - such as is it is - lies in its ability to broadcast and download small, easily digestible bits of bite-sized data. It's not complicated nor bloated, and in that respect, 2TwitMe is a perfect compliment to it: the app knows its purpose and fulfills it well. And as a bonus, it shows that there's still life left in FrankenGarnet yet, even in this, The Age Of The Cloud. MetaViewSoft will be cranking out updates for awhile yet, so I'm confident that those bugs I've mentioned will eventually be fixed. So to answer our original question: is it worth seven bucks? The answer will depend, I suppose, on how much inherent value you see in Twitter itself. But really, seven bucks? It's not a wallet-exploding sum, and considering the amount of work that MetaView must have put into it (what with Palm OS' creaky architecture) seems very reasonable indeed. 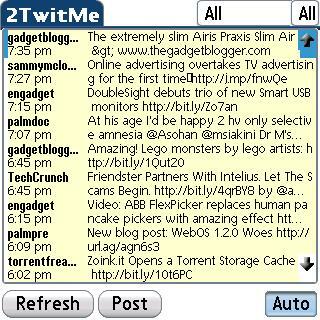 With an excellent feature list and some nifty tricks, 2TwitMe is definitely worth your time to check out. 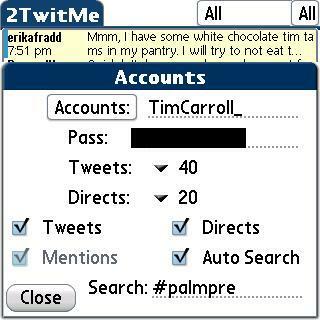 2TwitMe is available for $6.95 from the Palm Infocenter Software Store, and there is a free trial available. It is compatible with all Palm OS 5-based devices, and a beta of version 1.2 was reviewed on a GSM Palm Centro. Interested users can follow @PalmInfocenter on Twitter. Great review Tim. Used this app recently to tweet holiday progress. Well, I initially used Twitterrific on my wife's iPhone since the first version of 2TwitMe glitched with photo uploads. 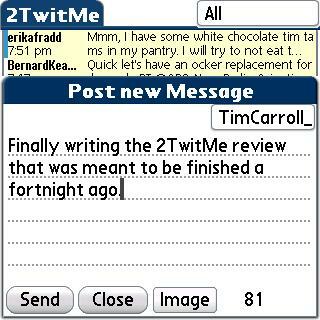 However, as soon as the update came through last week, 2TwitMe totally took over. Love the preview function. Love the seamless TwitPic support. Love the basic interface. Quick enough to do the job very nicely. Hard to get too excited about a social networking service. But holiday updates on Twitter are better than postcards IMHO. Well worth the purchase even if this is the only time I'll use it! Tim I really appreciate this review. The reason I am sad is to think that great developing on the Palm OS is going to cease to exist before too long. It wouldn't be quite so sad but when you start reading stories about the Palm Pre's wifi connection not working unless you have an active Sprint account, you wonder where the openness that has made Palm different (and better) then the competition has gone. So cheers to those developers still developing for frankengarnet. You still have at least one fan. 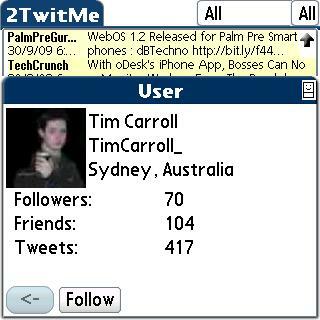 I am going to enjoy 2twitme to the fullest, possibly the last innovative app for Palm OS 5.0. Just to be accurate, let me remind you that it's not just the Pre's wi-fi capability--it's the ENTIRE damn unit! If you discontinue your Sprint service on it then want to power it on to check a phone number or look at a picture, you cannot. It's a very expensive brick unless it has an active data connection or has been hacked. RIP FrankenGarnet. RIP Zen. RIP Palm as we knew 'em. 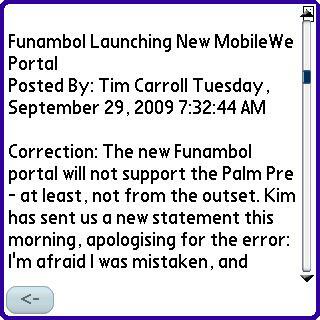 But on the New Palm's openness, I think it's still early days yet. Palm's attitude towards the homebrew webOS community and the hackers at WebOS Internals has been very promising thus far. The exclusive carrier agreements make me extremely unhappy (especially when Palm has always offered unlocked GSM phones in the past) but they can't last forever. It's a brave new world in mobile computing, and Palm are taking steps that others aren't. Who would've thought that the company that was mocked for so many years for its ancient, non-multitasking OS would later debut the best mobile multitasking platform yet? Give 'em time. Their heart seems to be in the right place. Sad but I think the exclusivity seems to be becoming a necessity in many cases. Maybe it was required as a foundation for investment in the OS by Sprint or to allow early testing? This still doesn't make nice of the excruciating wait for other carriers to get the devices. Oh well, I'm just glad for the promise webOS is expressing. Stuff like this proves that Palm OS is still a great OS- My only complaint with Palm OS it is that Blazer often fails to display all the pictures on a page. Can I get a new browser for my 755p...please!!! Worth the effort to spend some time working out an Opera configuration, my Centro config is so much fun.